Published in 1998, Limited Edition sold out. Crossing the Tyne to prepare for the first of my Newcastle paintings was my only visit to the city for thirty years when as a planning student I recall standing on the Quayside sketching cranes and finding out about the chares (narrow lanes running down to the waterside). The industrial prominance of the area was in decline then and much change was now taking place. This visit to the capital of the North East, during some very damp January days in 1998, was not ideal for experiencing the warmth of the local stone. However nothing could hide the splendour of the bridges leading the eye (plus people and goods) straight into the centre. In this area there is an abundance of historic and characterful structures ideal for a Newcastle cityscape, and the streets of classical buildings can hardly be matched by another English city. Richard Grainger's 'Tyneside Classical' around Grey Street and Grainger Street was being regenerated as part an initial six year project. 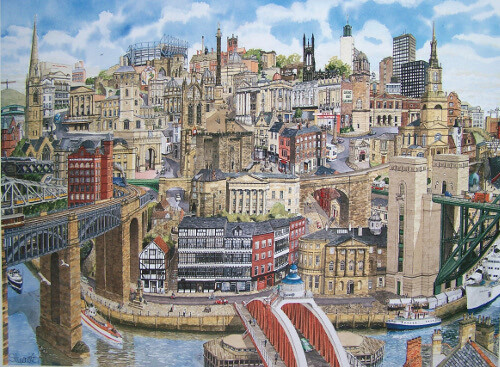 Greys monument towers over this part of town and it secured an important position in my Newcastle painting. I couldn't resist a place for the Angel of the North which had just been erected; the Mallard steaming towards the High Level Bridge reflected a train journey of mine as a child from London to Newcastle; Cunard White Star Line's shipbuilding links with the Tyne are remembered with the inclusion of the Mauretania, perhaps the most gracious of all the Atlantic passenger liners ; T. Dan Smith's legacy to the city — the Civic Centre; I had to relaunch Turbinia, having admired her at the Newcastle Discovery Museum (world speed record of 40mph in 1897, Marine Steam Co, Wallsend); plus many other landmarks which appeared in my Memories of Newcastle prints.